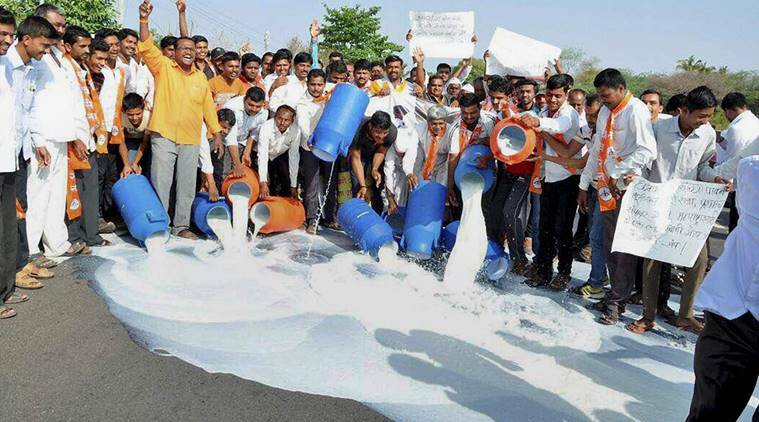 Thousands of milk farmers launched an agitation early on Monday, hitting the supply of fresh milk across big cities in Maharashtra, in support of various demands. Scores of milk tankers bound for major cities including Mumbai, Pune, Nagpur, Nashik, and others were blocked in different parts of the state, raising the specter of milk shortage. The farmers’ groups, led by Swabhimani Shetkari Sanghatana (SSS) and Maharashtra Kisan Sabha (MKS), are demanding a subsidy of Rs 5 per litre milk, waiver of goods and services tax on butter and milk powder among others. Tankers laden with lakhs of litres of milk were waylaid and emptied on the roads in Pune, Nashik, Kolhapur, Sangli, Beed, Palghar, Buldana, Aurangabad and Solapur, while at least one tanker was torched near Amravati en route to the big cities, which are totally dependent on supplies from the rural areas. In other places, activists performed the symbolic ‘dudh-abhishek’ with milk in major temples in Pandharpur, Pune, Beed, Nashik, Ahmednagar and others to lodge their protest even as the state government warned of strict action. At some places, top leaders like SSS President and MP Raju Shetti and MKS President Ajit Nawale took to the streets to block the milk tankers while several big and small milk cooperatives announced support to the farmers’ agitation. “The state government has fixed the procurement price of Rs 27 per litre but the farmers get barely Rs 17 per litre. We are demanding a direct subsidy of Rs 5 per litre to the farmers, as provided in Goa, Karnataka and Kerala. “With a drop in the rates of skimmed milk powder, even the milk cooperatives are facing a tough time,” Shetti told the media. Nawale said the government’s announcement of Rs 50 per kg subsidy for milk powder may not benefit the farmers since the prices of milk powder have come down in the international market, but would be a boon to private companies which convert milk into powder. “We are trying to resolve the issue. If anybody attempts to break the law, they will be dealt with sternly,” Jankar warned the farmers, and later said the government was prepared to give Rs 3 per litre subsidy.